Happy Monday friends! It honestly felt like we did it all this weekend - well, did a lot of my "holiday fun list" from last week that is!! It was the weekend of pop-ups & outdoor activities! After work on Friday I was invited to attend an event at the Kiehl's on Newbury Street for their new Apothecary Preparations line- a personalized Skincare Service. I sat down with a consultant & she went through the facial evaluation with me where we talked through my concerns and what I dubbed my "problem" areas and from that she created a personalized serum that will work to reduce fine lines and the texture of my skin! I love the personalized "prescription" look of the packaging too! I don't normally get to see a product work on the first use, but I had a pimple that I was able to use their spot treatment on and it was completely gone by Sunday! There were two holiday pop ups I was looking forward to attending this weekend - the first was the second annual South Boston Holiday Market. It's hard to think they will ever outgrow the Innovation & Design building because it's massive, but if it keeps growing - there is definitely going to be more than one floor to visit!! Since it's in the design building they have really fun installations both inside & outside the building - I also took my new OTK boots for a spin & sometimes with new shoes you never know if you're going to get a blister - thankfully they withstood 7+ hours of walking & standing! 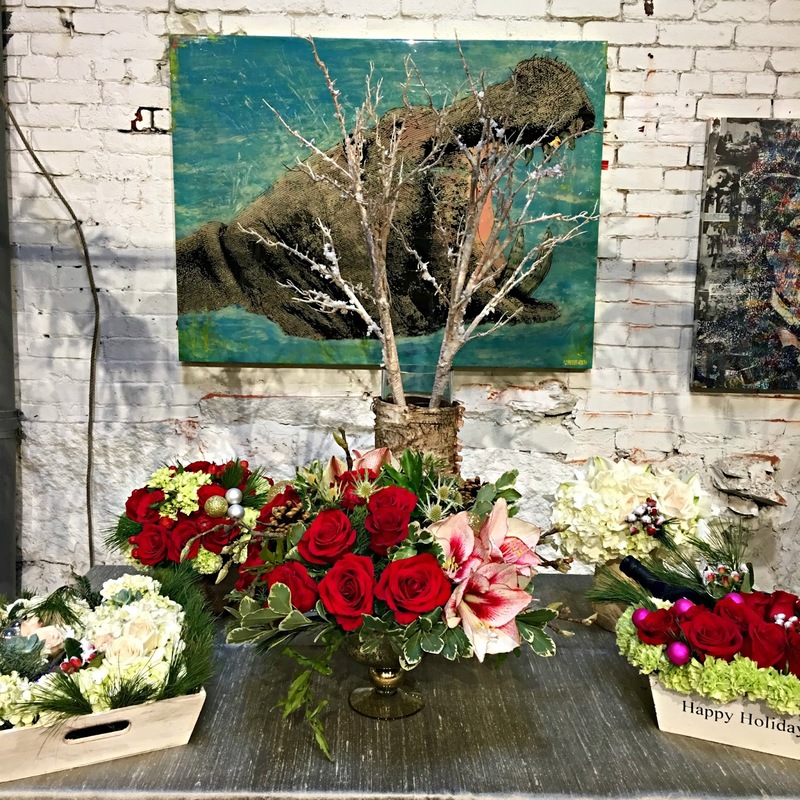 My friends from Whipped Urban Cupcakes and Floral Lab held a two day holiday pop up with flowers, fresh cupcakes & the most delicious coffee from The Well Coffee House- it was the perfect pit-stop on our way to watch the SEC Championship game. I mean we knew they weren't going to win, but it's never easy to watch! Before getting our day started on Sunday we hit the Bostonia Public House Brunch. We love the live music they have on the first floor (that you can still hear on the second floor) & their bloody mary bar!! I was starving so didn't snap a photo of the food (the horror I know LOL) but this wasn't our first time there and certainly wont be the last! I mean I'd go for the mini Tabasco sauces they have! How hilarious do we look in this ginormous chair! I wish Gary captured me trying to get out of it because that was a scene! I didn't know whether to try to scoot back up to get out or go under the arm part! 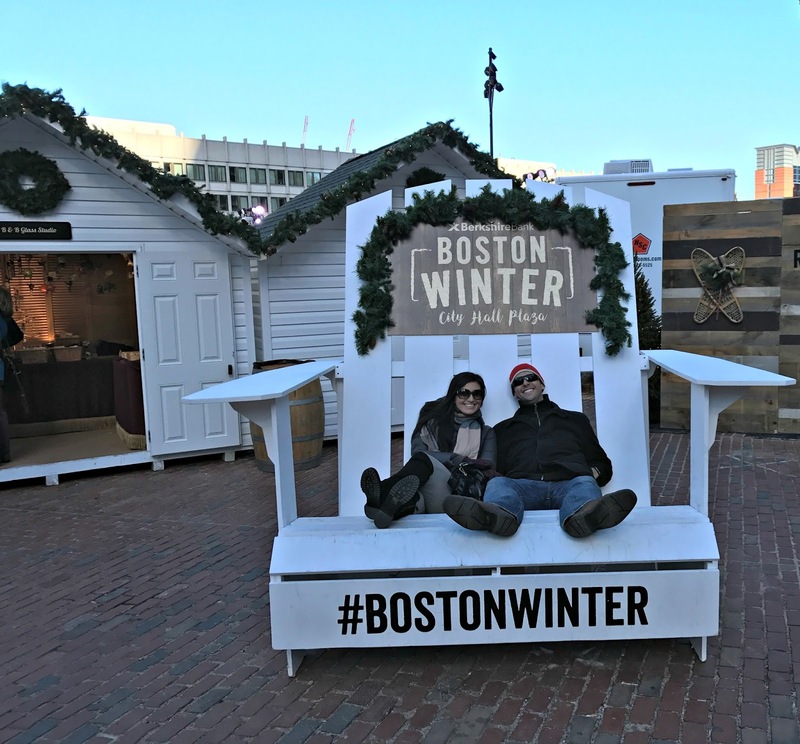 We made our way to City Hall Plaza to see #BostonWinter in action! Our first stop was Vinopolis - told you I'd get there soon! After spending an hour wine tasting, we walked around and explored some of the little shops & it's fun to know that this is going to be around all winter long! We'll definitely be back & I'm looking forward to the chocolate tasting they are going to have available soon! The weekend wrapped up with our first trip to Eataly!! What a scene! It was a little overwhelming - 45,000 s.f. will do that to you, but it was nice to see what they have available & after spending about 45 minutes walking around, we decided we would wait to have a proper sit down meal there - you know once the newness died down, but it's possible that this place will always be packed! It was a whirlwind, but I have a sneaking suspicion that's going to be the norm for the rest of the year! How was your weekend? Link up below to share! Hope you all have an amazing start to the week! So much fun!! You went to your new Eataly....we love the one in Chicago but go back when it's not crowded and you will enjoy the experience even more. LOVE the pic of you guy sitting in the big chair, I am a sucker for those big chairs. Rocking those OTK boots girl and looking Winter is upon us WONDERFUL!!! Happy week ahead!! What a fun weekend! You were super busy, but how great that there were so many amazing things for you to do and eat! I love the big chair, such a cute picture! What a busy but fun weekend! And so great the new boots held up with all that walking! That's awesome that you got to at least see Eataly -- you are probably right that it's best to wait for the crowds to die down before experiencing it completely. Happy Monday! What a great weekend! I love all the fun, festive things you did. Your Kiehl's visit sounds so neat! Those flowers are gorgeous from that pop-up - just so, so pretty! Hope you have just as great of a Monday! What a fun packed weekend. Such pretty pics and now you have me even more intrigued by kielhl's! I love that they can personalize a serum for just you...that's so cool! What a fun weekend! Looks like you packed it all in! I haven't invested in a pair of OKN boots (I feel like I'm the last person on earth who doesn't have any...) because I'm still a little intimidated by wearing such tall boots! But I could handle those MK boots because they're not tooooo high, you know? Super cute! Looks like an amazing weekend! I could totally use a personal "prescription" for my face! I have so many problem areas... I feel like a teenage girl still! Happy Monday! I had no clue Kiehl's did that, but I'll definitely be doing it soon! Love all things Kiehl's! And Bloody Mary bar? My fave! Sign me up! Ha! LOVE those OTK boots and that cute puffer coat! I seriously would LOVE to do some sort of skin consultation. I have been meaning to set up an appt. with an esthetician for the last year! Looks like SUCH a fun weekend! What a fun festive weekend! I've been wanting to go to Eataly in Chicago forever! Hopefully soon! They look like a great staple purchase! I brought mine to Atlanta this weekend and put some serious miles on them. Looks like you definitely fit a lot in this weekend for sure! what a beautiful weekend!! you always look so pretty! have a happy week! I love your puffy coat! Looks like y'all had a great time - and great news that the skincare line is working already! Wow - what a weekend!! 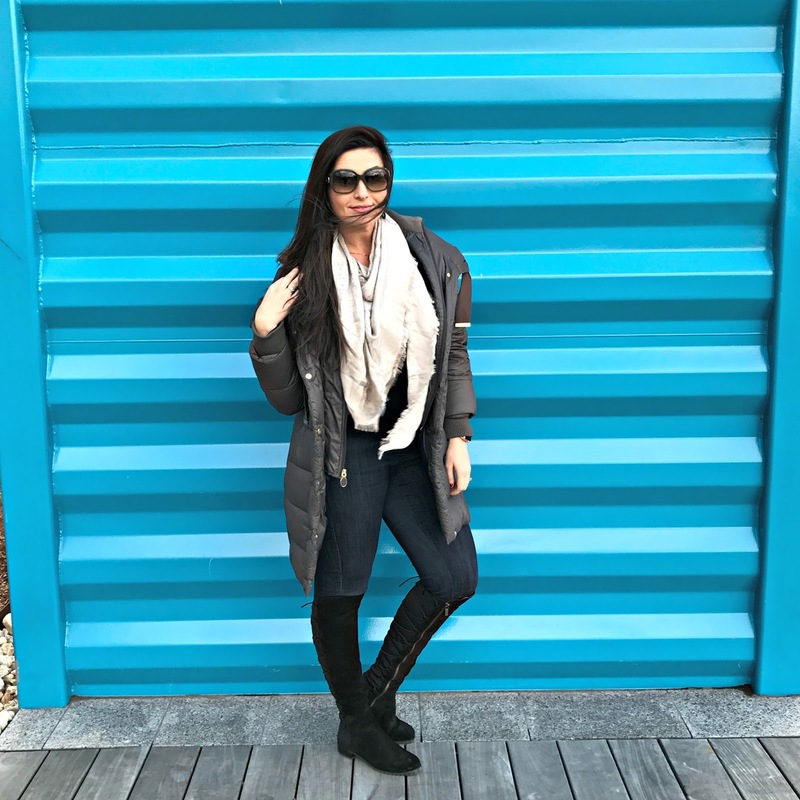 Boston is so perfect this time of year, and I love that you got to explore Eataly!! What a fun weekend! 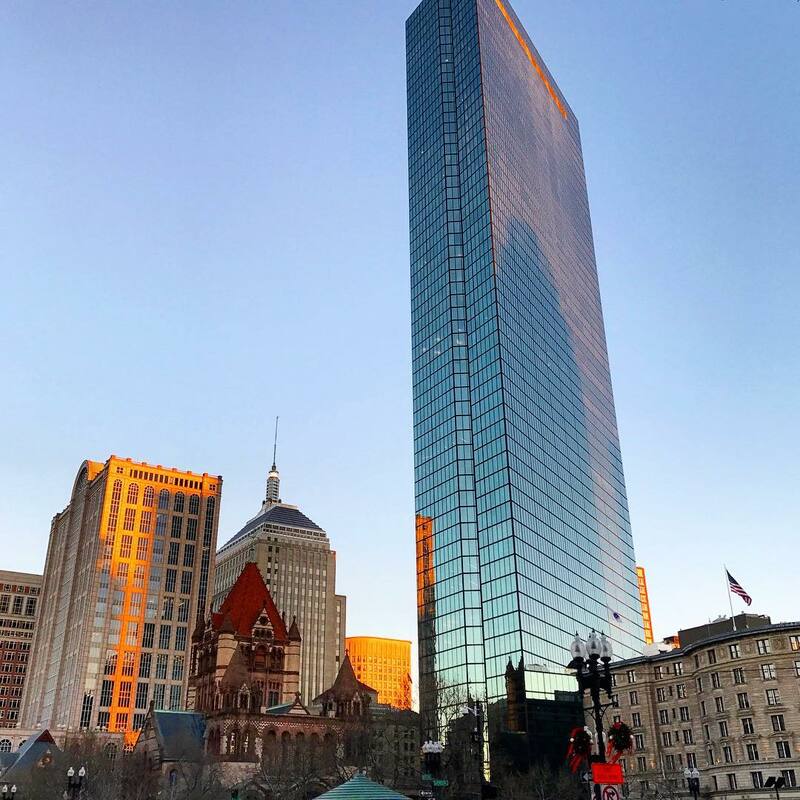 I always love seeing the snaps around Boston it makes me want to go so much more! I am obsessed with all the gorgeous christmas shots! Makes me so excited! That was fun! Perfect weekend out! The photos are telling the story! Looks like the perfect little holiday weekend! You're seriously making me consider Boston over Toronto for our trip next year! Talk about a busy weekend, but a fun one too! One of the things that I always worry about when I get new shoes is the blisters I'll get the first time I wear them, but I'm glad that your new boots worked out! Eately looks so awesome, and I think that my mouth started watering when I was watching your snaps while you were there! I hope that your Monday is off to a great start! What a fun busy weekend. So jealous that you went to Boston Winter. I cannot wait to go. Love that picture of the big chair, too funny. I did check out Eataly but was quickly overwhelmed and left. It looked pretty awesome tho. Happy Monday!! Fabulous holiday weekending! We have a few pop ups here that I need to get to, maybe this week. I was just telling Brandon that we need to do a Boston trip! I'm so asking you for all the advice!! Aww looks like a fun filled weekend. Thanks for sharing these lovely photos! What a fun and festive weekend! There is so much fun stuff happening this time of year that it is hard for a weekend to go by without being so full of activities! 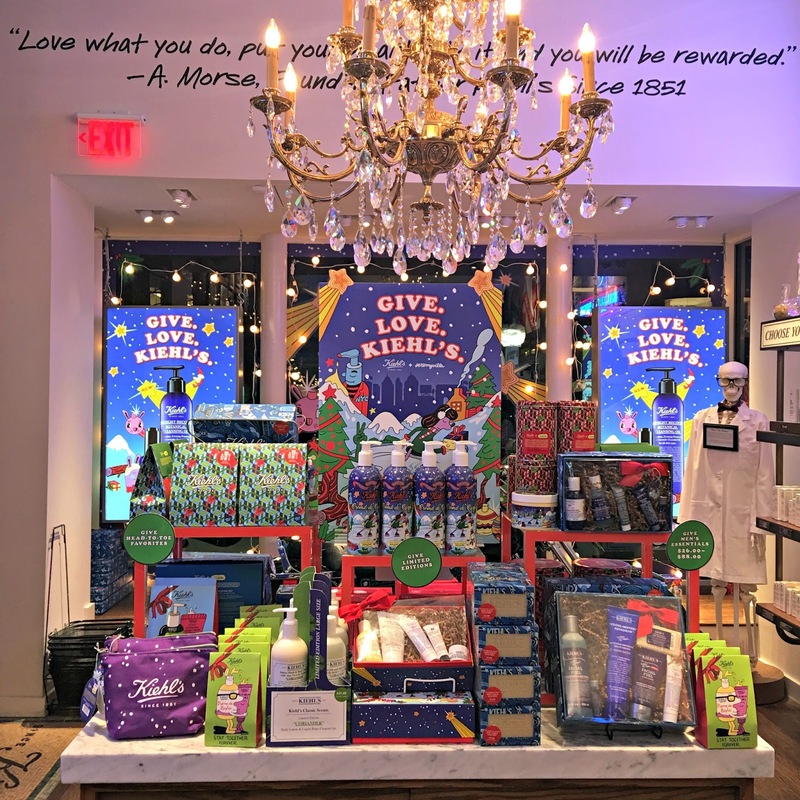 The apothecary preparations at Kiehl's looks amazing! It sounds like such a fun weekend, girlie! Then again, you guys are always doing some fun and exciting things during the weekend! Did you mentioned Eataly before? I feel like you've mentioned going in the past or maybe I heard about it somewhere else?! Either way, glad you got to go, it looks like such a fun and interesting scene. Lol, I literally laughed, you and Gary look too cute in those chairs, you have to print this photo and frame it, it's adorable! I went to the Kiehls in NYC before, but briefly. I get so nervous when trying new products because my skin is uber sensitive, but the serum and acne spot treatment sound convincing. I feel like my pimples stay foreverrrrrr, so I may have to check it out. Thanks so much for sharing, beauty, and I hope you have a wonderful weekend ahead! You always have the most fun weekends!! Everything looks so festive and fun in Boston right now and the events you attended look fabulous!! I love your new OTK boots- so stylish! :) And so sad about the Gators loss- I mean, i knew it would be a hard game but boy was it terrible!! What a fun weekend that you had! Eataly seriously looks so awesome. I love the picture of you two in the big chair - it's so cute and festive! You had a fun and full weekend - I was following along on your stories!! All of the events you attended looked so neat!! I am LOVING the pictures with the blue backdrop!! Stunning! Your pictures are looking so great! Such a fun weekend! I love all of the city activities!! Such a fun weekend, Biana! 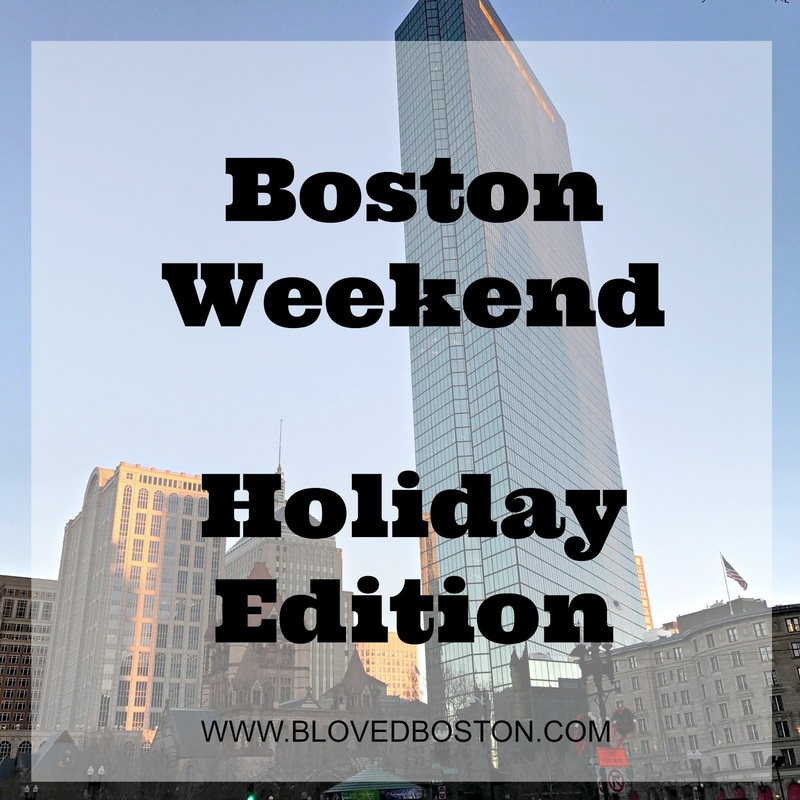 I love everything Boston has during this time of year, sounds like you guys will have something to do every weekend. Both holiday pop-ups you went to this morning look so gorgeous!! I always love hearing stories from your weekend! You seriously did ALL the things this weekend! I loved going to Eataly in Chicago, I went 2-3 times and all times it was packed wall to wall, I don't think the excitement of that place will ever die down. There are quite a bit of wait times, but if you get there at the right time I think you could get a table with a fairly decent wait time. Mini Tabasco sauces!!!! So cute. I thought that first picture of you in front of the blue was a painted wall - the 2nd picture shows its metal, right? But I love the look of it. What a fun weekend of good food and drinks. And cupcakes. I would love a "prescription" product just for my face. That is pretty awesome. I also need some spot treatment. I will check out Kiels. oh my goodness, what an awesome busy weekend! those big chairs are hilarious, we got photos in one on our cruise and yeah.. NOT easy to get out of! the apothecary preparations line sounds absolutely amazing. love how personalised it is! So much goodness in this post! The Kiehls event looked like so much fun! I have two of their moisturizers I've been going back and forth on trying! A pop-up with flowers, cupcakes, and coffee basically sounds like my dream come true & the Vinopolis sounds so fun! Loving your OTK boots too-- and a bonus they were comfortable for walking all day! Another fun weekend in the books! That Kiehl's serum sounds amazing. love your weekends! Boston is so on my list of places to visit and I need to quit putting it off! So many fun things!! The Eataly looked awesome but yes I can see how it would have been overwhelming! Kiehl's has some great products for sure. And now I want a facial evaluation. I think we all should do those every few years. Girl you look cozy and nice in your Wintery outfit. Love that coat. Please make sure you link this outfit and your latest post on my Thursday Moda this week. I miss you in there. What a weekend!! Y'all didn't waste a second of it, did you? Y'all look so cute sitting in the big ol' chair!! What a great weekend, except for that game, sorry! I love Eataly so much, it is so overwhelming like you said, but so great. Hope you are having a great day! You always have such fun weekends! Love your cute coat and those fabulous boots! Did you say, Bloody Mary bar?!?! I'd be all over that...! Those OTK boots are super cute!! You always have the most fun weekends. 45,000 sq feet? Yeah, definitely overwhelming. Love the OTK boots girl! The photo of the floral lab is so gorgeous! I feel like really nice arrangements are underused/underappreciated for every day occasions and I'd love to see something like that in person. Personalized skincare service sounds amazing!! What a fun weekend! That giant chair is hilarious! I love the Eataly in Chicago! Those OTK boots are fabulous! I love Kiehls!! What a fabulous experience! And a great Boston Christmas weekend! I love all the festive! That picture of you and the nutcracker is so cute! Sounds like a great weekend! I use Kiehl's body lotion and love it. I need to check out their other products! Your weekend posts always make me want to do weekends better. So fun! What a fun weekend, lady- and how awesome was that consult from Kiehl's? I love their products! Wow a personalised serum, I could definitely use one :) Sounds like you had a great weekend, and I love your outfit! How awesome are those Kiehl's products! I never heard of them! I like how they "personalize" based on your skin! You always do such fun things! Busy busy bee! ;) Love all the pics! Too funny about the enlarged chair! Personalized skincare recommendations are always awesome-sounds like such a fun event! You did so many fun things this weekend. Eataly looks amazing and yes, I would need lots of time to explore. I love Nutcrackers so I especially love the picture of you next to that one! You def had a busy weekend! Vinopolis was def my favorite part of Boston Winter. It was SO cold when I went so I didn't take the time to look at all th3 different vendors. The Muscato D'Asti at the wine tasting was soo good! It tasted like peaches. I want to check out Eataly but like as you said I've heard it's been crazy there and I'm gonna wait for the newness to die down.